When you present your message it is important to remember that your audience come with their own baggage before listening to you. They have their own projects, their own problems and their own concerns. If you want them to fully listen to your presentation then you have to wake them up and get them engaged in your topic from the beginning. Here are six ways you can use today to get your listeners attention right from the beginning of your talk. Walk on stage… Pause…Look at somebody and pause for 2 to 3 seconds and then start talking. This will get your audience listen to you in anticipation. What’s in it for your audience … make money, save time, increase productivity? Example: “ Today I will go over a proposal that will increase our operational efficiency as a company.” Note that this is close to the short and sweet approach above. A prop brings up the curiosity level of your audience. Bill Gates let loose of mosquitoes at the Technology, Entertainment, Design (TED) Conference to make a point about the deadly sting of malaria. “Malaria is spread by mosquitoes,” Gates said while opening a jar onstage at a gathering known to attract the elites of industry, government, and Hollywood. “I brought some. Here I’ll let them roam around. There is no reason only poor people should be infected:’ Gates waited a minute or so before assuring the audience the liberated insects were malaria-free. 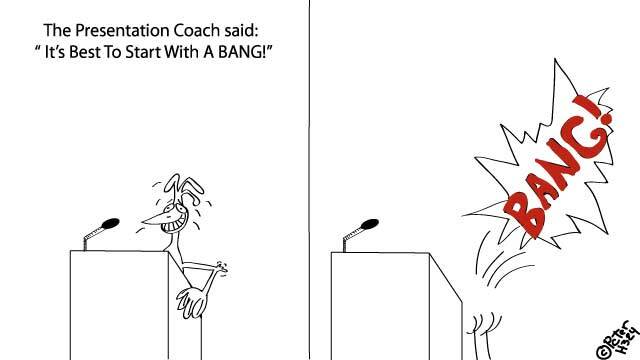 These six tools help you start your presentation with a Bang! Take one of these ideas and implement it today and notice how this gets your audience engaged.